Twenty-five years ago, Minneapolis was a hotbed of advertising, recognized around the world for its creative agencies and attention-getting work. But another marketing revolution was just getting started. Loyalty marketing, the idea that a brand could build meaningful and relevant relationships with its best customers through personalized communications, was just taking off. And The Lacek Group was there from the beginning, led by Mark Lacek and Peter Brennan, both veterans of Northwest Airlines and its popular WorldPerks program. As the company grew, it consulted with brands and industries all over the world, at one time servicing clients out of offices in Minneapolis, Atlanta, Japan, Korea, Australia and London. Even though Mark Lacek left the organization in the late 1990s, we’ve retained the name and heritage of helping clients acquire, build and retain loyal customers through innovative, data-driven programs. When printed statements and brochures went online, we became a digital powerhouse. When Big Data became all the buzz, we were well down the road of helping clients harness the power of known customer data. And as people all over the world spend more and more time interacting with a screen, we’re there to help make sure the information they receive from their favorite brands is meaningful and relevant, just as it was meant to be 25 years ago. 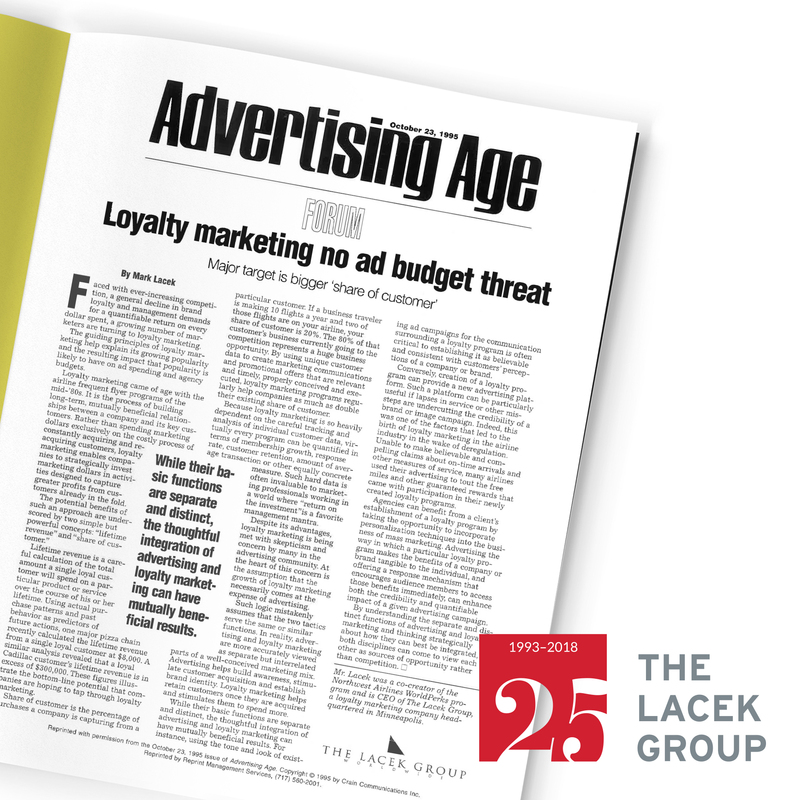 Today, the Lacek Group boasts an enviable list of Fortune 100 clients, a highly skilled and creative group of over 250 employees, an 18-year association as a specialist brand company of the Ogilvy Group, and a strong and international reputation as a leading loyalty and CRM marketing agency. Our executive leadership team has an average tenure of over 18 years, and most of our client relationships extend back ten years or more. So loyalty is something we continue to take very seriously, inside our walls as well as with our clients. But even as the meaning of loyalty changes in a mostly digital, everyone’s-connected world, the importance of loyalty hasn’t. And while some of our employees weren’t even born when the company was formed back in 1993, we’re counting on them to help guide and lead The Lacek Group through its next 25 years.